Submitted Photo Pictured are Tess Midkiff, Co-Chair of the PALS Grant Review Committee, Regina Tipton, Coordinator of the Scioto county Health Coalition and Freda Billiter, Co-Chair of the PALS Grant Review Committee. 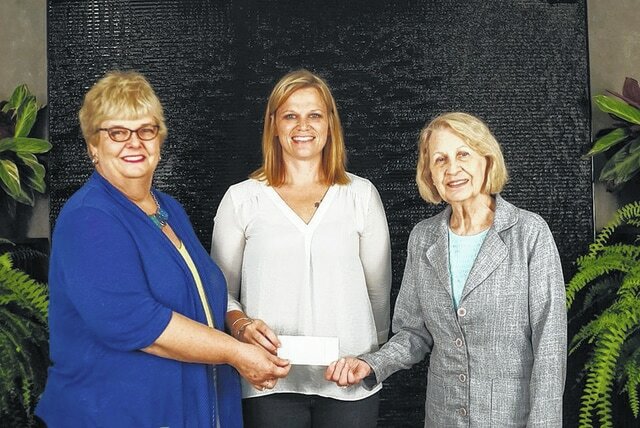 The Scioto County Health Coalition was recently awarded a grant from Portsmouth Area Ladies, Inc., (PALS) to support the coalition’s healthy plate initiative. The coalition has launched a Healthy Plate Initiative, designed to help residents recognize healthy meal options at local restaurants. She said once a dish is nominated it will be reviewed by a committee of the coalition that includes dietitians and nutritionists. If chosen stickers can be placed by the item indicating it a healthy option. Tipton said if restaurants are interested in creating a dish that would qualify, members of the committee would be available to assist. Tipton said the PALS Grant will fund the Healthy Plate Initiative. She said the grant will allow for mailing and the creating of brochures for the initiative. In early 2015, the coalition designated its healthy plates at Market Street Cafe — its veggie panini and their raspberry romaine salad. Tipton said there are a couple of healthy plates being considered by the committee. The goal of the Scioto County Health Coalition’s mission is to improve the health of Scioto County residents through partnerships and programs. The next meeting of the Scioto County Health Coalition is Aug. 14 at the ADAMHS Board offices, 9191 7th Street, Portsmouth. For more information about the coalition visit www.sciotohealth.org.